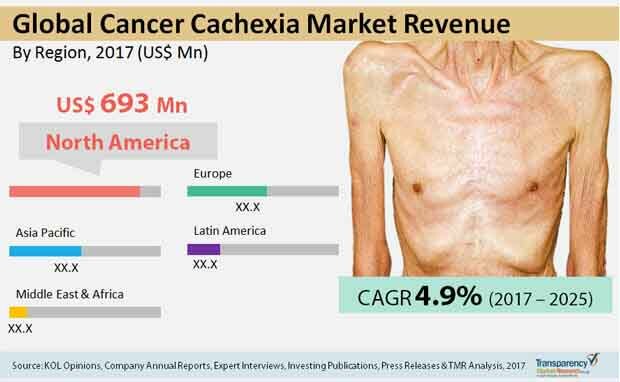 The global cancer cachexia market demonstrates a considerably high competition among the leading players, finds a new research report by Transparency Market Research (TMR). The key vendors of cancer cachexia treatment solutions, globally, are actively involving in partnerships, mergers, and acquisitions with clinical trial companies in a bid to strengthen their product portfolios. They are likely to focus more on technological upgrades and introducing new therapeutics based on appetite stimulation mechanism of action for the treatment of cancer cachexia in the near future, as it will be the new trend in this market. The key participants operating in this market are Æterna Zentaris Inc., Aphios Corp., Alder BioPharmaceuticals Inc., Eli Lilly and Co., Helsinn Group, GTx Inc., Merck & Co. Inc., Bristol-Myers Squibb Co., Novartis AG, and XBiotech Inc., states the research report. According to the research report, the global market for cancer cachexia was worth US$1.63 bn in 2016. Research analyst at TMR expect the opportunity in this market to rise at a CAGR of 4.90% during the period from 2017 to 2025 and reach a value of US$2.51 bn by the end of the period of the forecast. Among the therapeutics available for the treatment of cancer cachexia, the demand for progestogens is comparatively higher and is expected to remain so over the next few years, thanks to their efficiency. Regionally, the market is led by North America. Researchers project this regional market to continue on the top in the near future on account of the rising awareness among people regarding cancer supportive care, notes the market study. The increasing prevalence of cachexia, especially in industrialized regions, such as North America, Europe, and Japan, is the main factor behind the significant growth of the market for cancer cachexia, worldwide. According to an estimation, currently, cachexia affects around nine million patients, globally, which is round about 1% of overall patient-pool across the world. This factor is expected to create more opportunities for existing participants and players, looking to enter the market over the next few years. The strong product pipeline is another important factor that will support the growth of this market in the near future. “With a promising clinical pipeline and imminent regulatory approvals, the global market for cancer cachexia is likely to report a substantial growth in the years to come, states the author of the research study. Although the worldwide market for cancer cachexia points towards a thriving future; its growth trajectory will not be smooth enough. The stringent regulatory requirements and the long procedure for FDA approval may dissuade the manufacturers of cancer cachexia drugs from investing in this market over the forthcoming years, which, in turn, will impede the growth of this market in the long run, states the research report. The demand for progestogens is comparatively higher and is expected to remain so over the next few years. The global market for cancer cachexia is led by North America.